I just bought a '92 LX with a modded 302 (see list below), and have been having INTERMITANT ignition problems. Sometimes the car misses under acceleration and sustained RPMs (it's hard to tell at idle because of cam lope). Half the time, it runs smooth as silk. I haven't been able to correllate the misfire with any environmental (or engine temp) factors. I replaced the fuel filter, plugs, wires, cap, and rotor. ONLY the #6 plug had gas in the threads so I assume the misfire is there...but the rest looked fine. I'm racking my brain to figure out what would cause it to only miss SOMETIMES. I'm going on to the vacuum lines next, but would REALLY appreciate some insight so I don't spend more time and $$$ on this than I have to. Revised 26-July-2011. Added need to make sure the clutch is pressed when dumping codes. Codes may be present even if the check engine light hasn’t come on, so be sure to check for them. Here's the way to dump the computer codes with only a jumper wire or paper clip and the check engine light, or test light or voltmeter. I’ve used it for years, and it works great. You watch the flashing test lamp or Check Engine Light and count the flashes. Post the codes you get and I will post 86-93 model 5.0 Mustang specific code definitions and fixes. I do not have a complete listing for 94-95 model 5.0 Mustangs at this time. Be sure to turn off the A/C, and put the transmission in neutral when dumping the codes. On a manual transmission car, be sure to press the clutch to the floor. Fail to do this and you will generate a code 67 and not be able to dump the Engine Running codes. If your car is an 86-88 stang, you'll have to use the test lamp or voltmeter method. There is no functional check engine light on the 86-88's except possibly the Cali Mass Air cars. The STI has a gray connector shell and a white/red wire. It comes from the same bundle of wires as the self test connector. 89 through 95 cars have a working Check Engine light. Watch it instead of using a test lamp. WARNING!!! There is a single dark brown connector with a black/orange wire. It is the 12 volt power to the under the hood light. Do not jumper it to the computer test connector. If you do, you will damage the computer. Some codes have different answers if the engine is running from the answers that it has when the engine isn't running. It helps a lot to know if you had the engine running when you ran the test. Dumping the Engine Running codes: The procedure is the same, you start the engine with the test jumper in place. Be sure the A/C is off, and clutch (if present) is pressed to the floor, and the transmission is in neutral. You'll get an 11, then a 4 and the engine will speed up to do the EGR test. After the engine speed decreases back to idle, it will dump the engine running codes. Trouble codes are either 2 digit or 3 digit, there are no cars that use both 2 digit codes and 3 digit codes. For those who are intimidated by all the wires & connections, see Actron® for what a typical hand scanner looks like. Normal retail price is about $30 or so at AutoZone or Wal-Mart. Or for a nicer scanner see Equus - Digital Ford Code Reader (3145) – It has a 3 digit LCD display so that you don’t have to count flashes or beeps.. Cost is $30. Or for a nicer scanner see http://www.midwayautosupply.com/p-7208-equus-digital-ford-code-reader-3145.aspx– It has a 3 digit LCD display so that you don’t have to count flashes or beeps.. Cost is $30. Thanks for the replies, guys. I did pick up an OBD-I code box just after I bought the car (which had all of the mods already done to it...but I didn't notice the hiccup while test driving). I'm pretty sure the CEL has been tampered with, because there's no way that it would run like it did yesterday and not throw a code. I'm going to pull the codes this weekend and I'll post results before I jerk the distributor. This is my first time posting on a forum for help, and I can't tell you how much I appreciate y'all's input!! Start off by bypassing the msd box, and putting a stock FORD (not chain store) coil on the car. Not only are the msd parts worthless, they fail pretty often. The distributer is also a piece of junk. Failed sensor, carbon between EGR pintle valve and seat holding the valve off its seat. Remove the EGR valve and clean it with carbon remover. Prior to re-installing see if you can blow air through the flange side of the EGR by mouth. If it leaks, there is carbon stuck on the pintle valve seat clean or, replace the EGR valve ($85-$95). Conventional cleaning methods like throttle body cleaner aren’t very effective. The best method is a soak type cleaner used for carburetors. 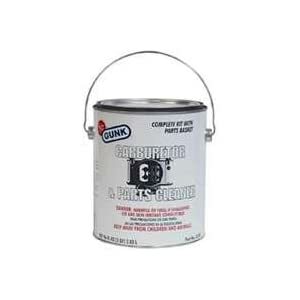 If you are into fixing motorcycles, jet skis, snowmobiles or anything else with a small carburetor, you probably have used the one gallon soak cleaners like Gunk or Berryman. One of the two should be available at your local auto parts store for $22-$29. There is a basket to set the parts in while they are soaking. Soak the metal body in the carb cleaner overnight. Don’t immerse the diaphragm side, since the carb cleaner may damage the diaphragm. If you get any of the carb cleaner on the diaphragm, rinse it off with water immediately. Rinse the part off with water and blow it dry with compressed air. Once it has dried, try blowing through the either hole and it should block the air flow. Do not put parts with water on them or in them in the carb cleaner. If you do, it will weaken the carb cleaner and it won’t clean as effectively. If you have a handy vacuum source, apply it to the diaphragm and watch to see if the pintle moves freely. Try blowing air through either side and make sure it flows when the pintle retracts and blocks when the pintle is seated. If it does not, replace the EGR. If the blow by test passes, and you have replaced the sensor, then you have electrical ground problems. Check the resistance between the black/white wire on the MAP/BARO sensor and then the black/white wire on the EGR and the same wire on the TPS. It should be less than 1.5 ohm. Next check the resistance between the black/white wire and the negative battery post. It should be less than 1.5 ohm. Note that all resistance tests must be done with power off. Measuring resistance with a circuit powered on will give false readings and possibly damage the meter. The EGR sensor is a variable resistor with ground on one leg and Vref (5 volts) on the other. Its’ resistance ranges from 4000 to 5500 Ohms measured between Vref & ground, depending on the sensor. The center connection of the variable resistor is the slider that moves in response to the amount of vacuum applied. The slider has some minimum value of resistance greater than 100 ohms so that the computer always sees a voltage present at its’ input. If the value was 0 ohms, there would be no voltage output. Then the computer would not be able to distinguish between a properly functioning sensor and one that had a broken wire or bad connection. The EGR I have in hand reads 700 Ohms between the slider (EPV) and ground (SIG RTN) at rest with no vacuum applied. The EGR valve or sensor may cause the voltage to be above closed limits due to the manufacturing tolerances that cause the EGR sensor to rest at a higher position than it should. Code 96 causes & tests 91-93 models. – KOEO- Fuel pump monitor circuit shows no power - Fuel pump relay or battery power feed was open - Power / Fuel Pump Circuits. The fuel pump circuit lost power at one time or another. Diagram of the fuel pump wiring for 91-93 cars. Look for power at the fuel pump - the fuel pump has a connector at the rear of the car with a pink/black wire and a black wire that goes to the fuel pump. The pink/black wire should be hot when the test connector is jumpered to the test position. To trick the fuel pump into running, find the ECC test connector and jump the connector in the lower RH corner to ground. No voltage when jumpered, check the fuel pump relay and fuse links. Power feed: Look for 12 volts at the pink/black wire (power source for fuel pump relay). No voltage or low voltage, bad fuse link, bad wiring, or connections. Remember that on 92 or later models the fuel pump relay is located under the Mass Air meter. Watch out for the WOT A/C control relay on these cars, as it is located in the same place and can easily be mistaken for the fuel pump relay. Relay: Turn on the key and jumper the ECC test connector as previously described. Look for 12 volts at the dark green\yellow wire (relay controlled power for the fuel pump). No voltage there means that the relay has failed, or there is a broken wire in the relay control circuit. Using the diagram, check the dark green/yellow wire from the fuel pump relay: you should see 12 volts or so. If not the relay has failed or is intermittent. Check the inertia switch: on a hatch it is on the drivers side by the taillight. Look for a black rubber plug that pops out: if you don't find it, then loosen up the plastic trim. Check for voltage on both sides of the switch. If there is voltage on both sides, then check the Pink/black wire on the fuel pump relay: it is the power feed to the fuel pump. Good voltage there, then the fuel pump is the likely culprit since it is getting power. No voltage there, check the Pink/black wire, it is the power feed to the fuel pump relay & has a fuse link in it. Good voltage there & at the dark green/yellow wire, swap the relay. Code 12 -Idle Air Bypass motor not controlling idle properly (generally idle too low) - IAB dirty or not working. Clean the electrical contacts with non flammable brake parts cleaner at the same time. Conventional cleaning methods like throttle body cleaner aren’t very effective. The best method is a soak type cleaner used for carburetors. If you are into fixing motorcycles, jet skis, snowmobiles or anything else with a small carburetor, you probably have used the one gallon soak cleaners like Gunk or Berryman. One of the two should be available at your local auto parts store for $22-$29. Take the solenoid off the body and set it aside: the carb cleaner will damages some types of plastic parts. Soak the metal body in the carb cleaner overnight. There is a basket to set the parts in while they are soaking. When you finish soaking overnight, twist the stem of the IAB/IAC that sticks out while the blocker valve is seated. This removes any leftover deposits from the blocker valve seat. Rinse the part off with water and blow it dry with compressed air. The IAC/IAB should seal up nicely now. Once it has dried, try blowing through the bottom hole and it should block the air flow. Reassemble and reinstall to check it out. Code 41 or 91 Three digit code 172 or 176 - O2 sensor indicates system lean. Look for a vacuum leak or failing O2 sensor. Code 91 is the LH side sensor. Measuring the O2 sensor voltage at the computer will give you a good idea of how well they are working. You'll have to pull the passenger side kick panel off to gain access to the computer connector. Remove the plastic wiring cover to get to the back side of the wiring. Use a safety pin or paper clip to probe the connections from the rear. The computer pins are 29 (LH O2 with a dark green/pink wire) and 43 (RH O2 with a dark blue/pink wire). Use the ground next to the computer to ground the voltmeter. The O2 sensor voltage should switch between .2-.9 volt at idle. Measuring the O2 sensor voltage at the computer will give you a good idea of how well they are working. You'll have to pull the passenger side kick panel off to gain access to the computer connector. Remove the plastic wiring cover to get to the back side of the wiring. Use a safety pin or paper clip to probe the connections from the rear. The computer pins are 29 (LH O2 with a red/black wire) and 27 (RH O2 with a gray/lt blue wire). Use pin 32 (gray/red wire) to ground the voltmeter. The O2 sensor voltage should switch between .2-.9 volt at idle. Most of the common multimeters have a resistance scale. Be sure the O2 sensors are disconnected and measure the resistance from the O2 sensor body harness to the pins on the computer. Make sure you have the proper 3 wire O2 sensors. Only the 4 cylinder cars used a 4 wire sensor, which is not compatible with the V8 wiring harness. A secondary problem with only a code 41 is for cars with an intact smog pump and cats. If the tube on the back of the heads clogs up the driver’s side, all the air from the smog pump gets dumped into one side. This excess air upsets the O2 sensor calibration and can set a false code 41. The cure is to remove the crossover tube and thoroughly clean the insides so that there is no carbon blocking the free flow of air to both heads. UPDATE: Since the car IS older, I went for replacing parts instead of cleaning. New EGR and O2 sensors make the car run GREAT when it's not doing the same crap it was before. Still runs smoothly after warming up, but while sitting at a light for more than a minute at idle, the idle will drop off a couple hundred RPMs. This results in bucking during acceleration and halting/bucking when I try to maintain a constant RPM/speed. Turning the car off and back on fixes the problem for a few minutes. If nothing else, the new parts do affect performance when things are running well. If the gear comes off the shaft that easily, it's no good. The roll pin alone won't sustain the torque. I've gone through 2 Cardone remanufactured dizzys, within a week, 1 set a code 14-C (bad PIP), the other had stripped mounting threads for the TFI. A parts store PIP is $20, but I don't trust them anymore. My symptoms sound similar to the OP's, problem just seemed to get worse over time. Tested everything first according to jrichker guidelines. Waiting on a new Motorcraft dizzy & TFI. I'm in the same place, spent 2-3 weeks testing everything, dizzy is backordered, probably another week or two before arrival. I dropped in a reman dizzy with a new tfi and now the car runs great! Hope you get your figures out soon. Engine 89 Mustang Gt Wont Spark. Wierd Situation Please Help!! !